No doubt about it, cleaning the house is a chore. However, it can either be a huge chore to be avoided at all possible costs — a bone of spousal contention, and a bane of your existence — or it can be something that is done relatively quickly and without too much stress and frustration. It all comes down to pre-work, organization, tools, logistics, and attitude. This tip is simple but oh, so crucial: keep your house clutter free on a daily basis. That means, everybody has to put away things from whence they got them once they’re done with them. If this is a relatively novel idea for you and your family, it might take a bit of time to learn to stick to it on a daily basis. But, really, it only makes sense, doesn’t it? Clothes go back into the closet at the end of the day and hung on a hanger! Beds are made in the morning (it literally takes only a minute). Dirty clothes are put into the hampers. Toiletries are put away into vanity drawers. Books are back on the shelves, newspapers are deposited into the recycled bin the day, toys are back in the designated crates or boxes, and dirty dishes are in the dishwasher. You get the idea, right? 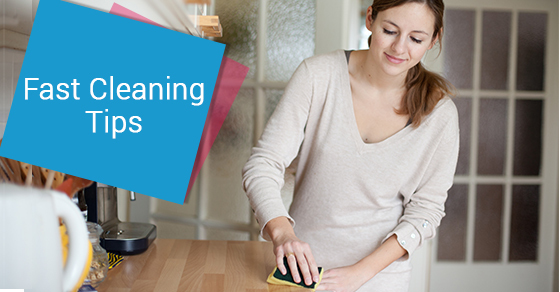 Cleaning up small messes as they happen, will also cut down on time and effort later on. For instance, use a squeegee on glass shower doors and walls after daily showers, and keep disposable wipes for quick clean ups in the bathrooms and kitchens. You’ll find this daily modus operandi the biggest time saver when the time comes to doing your regular full-monty house clean. Cabinets, baskets, benches, racks – there are so many of these handy storage appliances on the market. They can be used to put away all kinds of items (toys, magazines, shoes,) that are often left lying around, adding to your cleaning time. If your family is a bit of a rat-pack, maybe it’s a good idea for you to go through the house and force yourself to get rid of (or store) those seldom used items. Fewer things in the room means less time spent on dusting, and more time for other more pleasant tasks! Schedule a time for your weekly or bi-weekly house cleaning. Saturday morning is usually the most convenient time for working couples, but if your schedule is flexible, pick any day of the week, ideally in the morning, and stick to it. Put together your own “cleaning lady uniform.” It doesn’t matter if it’s just a T-shirt, baggy pants and running shoes, or an actual uniform. As long as it’s an outfit designated solely for cleaning. Wearing it will put you in the right mind frame for cleaning. When cleaning, carry a tote tray with all your cleaning materials and tools so you don’t have to run back and forth from the area you’re cleaning to where you usually store them. The tray should contain all the tools, cleansers, brushes, and rags needed to do your job. Of course, the more people involved in the cleaning, the faster it goes. Make the weekly clean a family endeavour. You will be teaching your kids the importance of order and cleanliness, and they also will be far less inclined to leave a mess during the week if they know they’ll have to clean it up later on. It might be useful to think of your weekly cleanup as a chance to burn some calories and get some exercise. An hour of moderate housecleaning melts approximately 150 calories. House cleaning can actually be fun. Put on your favourite tunes, crank up the music, and dance around the house while doing the deed. It’s hard to feel stressed and bored while you’re whirling around to upbeat music. You can also turn on your favourite television show, or listen to a book on tape during the process. Remember, while your regular cleanups will keep the house well maintained on a weekly basis, it might be a good idea to periodically hire a professional cleaner to give your house a thorough, top to bottom cleaning, which will include bigger jobs such as windows, ovens, fireplaces, and appliances. There are many nooks and crannies in the house that may not require a weekly attention, but over time these become a catch-all for cobwebs and insects and other crawly creatures!